Much like in 1837, the stock market peaked in inflation-adjusted value years ago (in 2000). Private debt levels are now over 250% of GDP. Dr. Marc Faber has recently described the current environment as “a buying frenzy or buying panic during which investors collectively believe that they can play the asset inflation game until it stops and then all get out profitably at the same time.” Others are noting similarities to the credit boom of the 1830s. Edward Chancellor, author of Devil Take the Hindmost: A History of Financial Speculation, has recently penned a second book titled Crunch Time for Credit. According to Chancellor, “The growth of credit has created an illusory prosperity while producing profound imbalances in the British and American economies...When credit ceases to grow, the weakened state of these economies will become apparent." Chancellor warns: "It will also become clear that the credit boom, by inflating asset prices and boosting profits, has lead to inappropriate balance sheets (both for the private sector and in general). At some stage, balance sheets will have to be adjusted to face a new reality. The process of adjustment is likely to be painful. It may well end in either an extraordinary deflation...or an extraordinary inflation." As our readers know, we first expect deflation as the asset bubble fizzles. 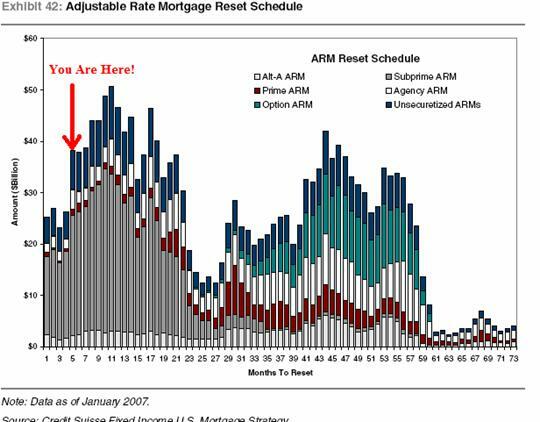 The economy has already started the painful adjustment process in one asset class: real estate. The investment herd now believes that residential real estate can fall in value without creating any major spillover effects into the rest of the economy. 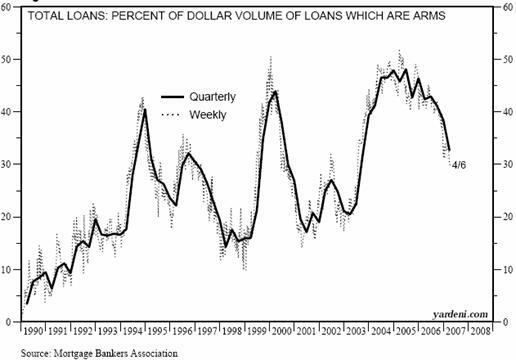 As you can see from the chart below of total loans created since 2002, 20%-50% have been adjustable rate mortgages ‘ARMs’. In the Reset Schedule below from Credit Suisse, over a trillion dollars in ARMS will adjust in rates over the next 5 years. We expect more foreclosures as these rates rise. Currently here in Alabama, 18.2% of subprime loans are delinquent according to the Mortgage Bankers Association. As Wells Fargo CEO Richard Kovacevich said in December about the subprime market: ``I am not a forecaster of the future; I'm a historian. And history says this will blow up. It always has. And there will be some blood on the street.'' But whose blood? To reiterate: In a crisis, a financial institution’s capital cannot be separated from a hedge fund arm, proprietary trading desk or prime brokerage unit. In a forgotten lesson of history, investment bank Goldman Sachs’ Trading Corporation failed due to trading losses in 1929. Goldman Sachs was only resurrected by refocusing the company on investment banking and abandoning trading altogether. But after a long bull market, memories get foggy. Almost 70% of Goldman Sachs’ profit in 2006 was earned from trading and principal investments. Also Goldman Sachs and Morgan Stanley are also the two largest prime brokers, whose service includes providing leverage to hedge funds. Investors should remove investment risk from their portfolio by holding cash. But they should also be moving accounts to financially healthy institutions. Sometime in the near future, as in the Panic of 1837, there will be a realization point that preservation of funds is paramount in a deleveraging economy.